Roasted Sweet Potato Casserole Bites with Oatmeal Cookie Crumble. I’m having a serious moment with this cookie crumble. 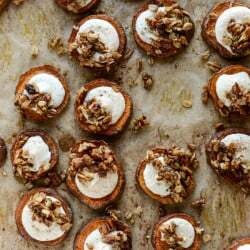 It all started right here with these cinnamon sugar hasselback sweet potatoes – and let’s be real, this is kind of just a deconstructed version of those for times when you don’t feel like using a knife carefully. But better – because marshmallow! I’m not sure what it is about sweet potato casserole, but it just feels a bit more laborious than these bites. At times, at least. There’s the cooking of the potatoes, the whipping of the potatoes, the sweet additions, the topping and possible (required) marshmallow. You know? With these little guys, you just roast some spiced rounds like you would for dinner, top them with some easily whipped meringue and finish off with the cookie crumble right out of the skillet. Obsession is quite overused but these are worthy of the word. The only downside to these adorable buttons is that they can’t reallllly be made ahead of time, like a casserole could. So they may work best as an appetizer or at a small gathering for dinner. Or heck – for your dinner tonight! Yes I rather like that idea. We can keep it Thanksgiving-y all year round. Preheat the oven to 400 degrees F. Place the sweet potato rounds in a large bowl. Whisk together the syrup and olive oil, the pour it over top of the potatoes and toss to coat. Whisk together the sugar, cinnamon, salt, pepper, nutmeg and ginger. Sprinkle it over the potatoes and toss until it’s evenly distributed. Spread the sweet potatoes out on a baking sheet covered with parchment paper (you may need 2). Bake for 15 minutes, then flip and bake for 15 minutes more. Right before the sweet potatoes are finished baking, make the meringue. When the potatoes are finished, reduce the heat to 325 degrees F.
Beat the egg whites in the bowl of your stand mixer (or by hand, with a whisk!) until frothy. With the mixer on medium-low speed, very slowly sprinkle in the sugar while beating. Beat until stiff peaks form. Spoon or pipe the meringue over top of each sweet potato round. Place the potatoes back in the oven and bake for about 8 to 10 more minutes, just until the meringue gets slightly golden and done to the touch. Remove from the oven and let cool slightly before topping with the crumble. Heat a skillet over medium heat and add the butter. Once melted, toss in the oats, sugar, pecans, cinnamon and salt, stirring to coat. Cook, tossing and stirring often, until the oats toast and the sugar is caramely, about 5 to 6 minutes. Spread the mixture on a piece of parchment paper and let cool completely. Break apart into pieces and sprinkle on top of the meringue before serving. Now somebody please make me a stuffing bite. i love the idea of all these textures! and i’m always game for crumble/streusel (especially when there’s butter and oats involved). YESSSS the texture is what does it for me! so much. As a confessed sweet potato + marshmallow fanatic, these sound incredible! The perfect sweet appetizer :) love that oatmeal cookie crumble, I bet it pairs perfectly with the roasted potato! stuffing bite? ask and you shall receive . i should’ve known you’d come through! LOVE the idea of serving these as an appetizer! that cookie crumble sounds INSANE. No wonder you been having moments! These sweet potato bites are so fun and cute! I love them! I use to make manage cookies so let’s just leave it at add it to a recipe and you have my attention. Add it to sweet potatoes and you are singing my song. I absolutely think sweet potatoes are about the best form of potato there is. I’m not sure this is one I’ll share with my hubby (he’s diabetic) but I know at least most of my guys (have 4 more of them) will enjoy munching on these with me so I will not be eating alone. I agree hasselback potatoes are so impressive looking but let’s face it the word hassle is in there for a reason and this version just seems to take the hassle out of a wonderful seasonal treat although I am not sure it can just get relegated to the Fall. So, I made a sweet potato casserole last year for Thanksgiving – my first away from my family. However, you’re right, it did seem a bit laborious. Worth it, but a bit much. This year, I’m adding these to my menu – so glad I spotted your recipe! Oh my goodness… These look so good and so dangerous. A sweet potato casserole that I can easily pop into my mouth EVERY SINGLE TIME I WALK THROUGH THE KITCHEN? YES!!!! Do you think these would work if they were made in advance and transported? Would the meringue hold up? Thinking about taking these for work Thxgiving – already planning on your lightened up sweet potato casserole (again) for home Thxgiving! unfortunately i really don’t think they would – they would be cold by the time you got them somewhere (since the little rounds cool down so much) and i don’t know what reheating would do, i think the meringue would melt somewhat and the potato would be soggy? Amazing picture and it is looking really cool..!! !